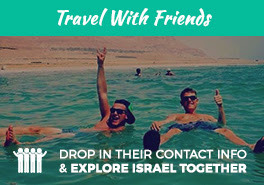 Go beyond experiencing the phenomenal culture, food, & vibes of Israel & spend 10 legendary days with the locals on this once-in-a-lifetime opportunity, where you’ll live it up in Israel with amazing people. Bring your crew, make new friends on campus, stay in Tel Aviv, experience the magic of Shabbat in Jerusalem, & so much more! From exploring one-of-a-kind cities & cuisine with the best local flair to taking part in fun & gratifying hikes with inspiring views, there is so much for you to discover on this epic journey with us & other Badgers, so make this winter the best one yet. Travel with us & JNF this summer on trips leaving from New York or Chicago! "It's hard to fully describle how amazing the past 10 days have been. Birthright was more than I ever could have asked for!"